Set against the beautiful tropical landscape of Honolulu, Hawaii, this series centered around the cases of Hawaiian Eye Private Investigations and the two handsome, slick, tough-guy detectives who ran the firm, Thomas Jefferson Lopaka, or Tom for short, and Tracy Steele, a Korean War veteran and former city police detective. 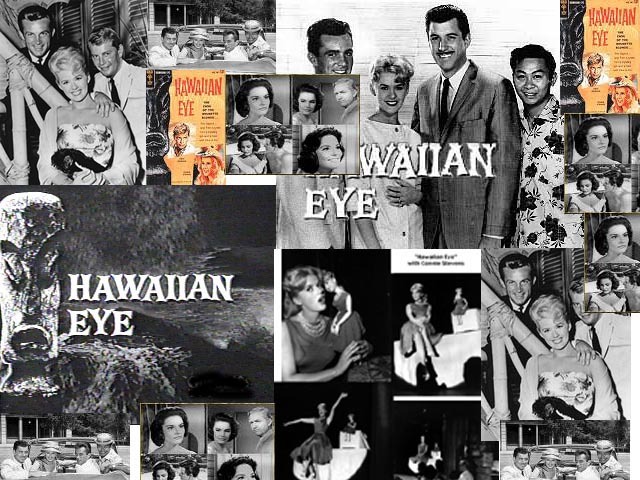 They operated out of a swank office at the Hawaiian Village Hotel, where they were also the house detectives. Assisting them occasionally was a funny, ukulele-strumming Hawaiian taxi driver named Kazuo Kim, whose wardrobe, consisting of a straw hat and crazy Hawaiian shirts, and numerous relatives living all over the Hawaiian Islands, willing to help his employers if they needed it, provided invaluable comic relief. They were also aided by a dim-bulbed, scatter-brained, flippant nightclub singer and photographer named Chryseis “Cricket” Blake. Later joining the team, was private eye Greg MacKenzie, an old friend of Tom’s from the mainland. Troy Donahue came along in the last season, as hotel Social Director Philip Barton. Lieutenant Danny Quon was their contact on the police force who was always on call to provide any vital information that could help the Eyes crack a case.